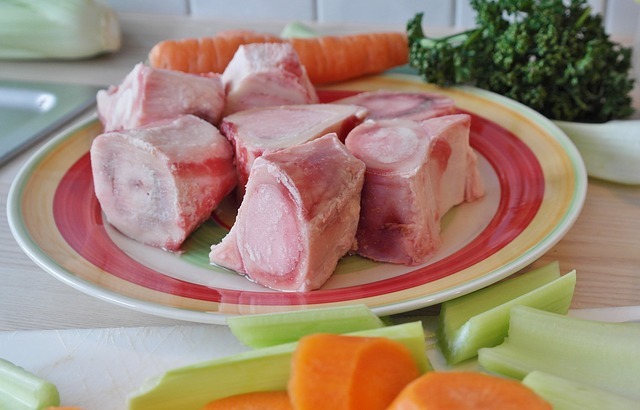 Slow-cooked, grass fed bone broth in all it’s savory glory. Mouth-watering, mineral-rich and full of health-promoting nutrients. And it couldn’t be easier to make! Plus, your gut is going to love you for it. Wash and chop veggies into large pieces - large enough that they won’t turn to mush. Place your bones onto a baking sheet and place into the oven. Cook for 30 minutes. Tie your herb sprigs into a bundle with cooking-safe string. Once your bones have roasted, pull them out of the oven and put them directly into a slow cooker. Add the veggies and the herb bundle into the cooker with the bones. Fill a 6-quart slow cooker with fresh water up to about ¾ inch under the rim. Add the bay leaves, ACV and salt. Cook in your pot on low; you should have a gentle, rolling boil after an hour or so. Remove the herbs after about 4 hours, otherwise your broth may look strange from the colors seeping out! Remove the veggies once they’re very soft, but not yet mushy. Let the bones cook for a total of 12-48 hours. Strain the broth, let cool a bit, and store in glass jars for up to ONE WEEK in your fridge. You can also freeze the broth if you don’t use it right away. The appearance of a gel-like substance (natural gelatin) is normal and desired - enjoy the gut-friendly goodness!